Don’t get over the euphoria of new beginnings very quickly, its all good, but there are lessons that must remain. Not sure if you have taken a recent tour of your wardrobe. I try to do this twice every year, I call it a ‘self-image review session’. Each occasion always makes me wonder where all the acquired cloths have come from. Its always a very short, momentary experience as I recall the many journeys to the shop, arriving home with bags (different colours, brands, shapes, weight and sizes). And now, not surprising, a wardrobe filled with exciting stuff, some boring skirts, trousers over worn, tight jumpers and so on. Hmm …. time to make room for the new. When you desire to walk in God’s authenticity, you cannot afford not to have moments of self-assessment, they are very crucial. Ask yourself what must go and what should stay? Behaviour, attitude, mind-set, belief system, likes, dislikes and so on. We are called to be Christ like, imitating Him in all aspects of our daily living. We must get to a point in our spiritual journey where the question, ‘what will Jesus do?’ becomes a familiar phrase in our mind vocabulary. This brings me to the wardrobe which the Lord already have hand picked for you and me. This over shadows the most glamorous and expensive wardrobe in the entire world. The garments were carefully designed to fit all shapes and sizes, BUT love is required to gain access. Compassion, kindness, humility, quiet strength, discipline, forgiveness, contentment and gentleness are the all purpose garment. In them, every woman looks gorgeous, beautiful and irresistible regardless of the occasion. Each of these garments are beyond self, they are relational. Having compassion on the sick, the poor and those who have suffered loss sends out the aroma of Jesus. Overlooking others mistakes, even if they are expensive ones, show how kind a believer can be. Forgiving each other simply means giving a friend a second chance, Jesus the radiance of God, gave mankind a second chance by His blood. To demonstrate fairness and give mercy, acknowledging the privileges given by God in humility. Taking time to walk in the spirit and discover strength in silence, at the feet of Jesus. To be that new woman takes a deliberate action, it starts with the desire to walk closer and deeper with our Lord Jesus Christ. If you are determined to walk hand in hand with Jesus, He will teach you and ensure your light keeps shinning brightly. This year, fill your wardrobe with the Lord’s all purpose garment. 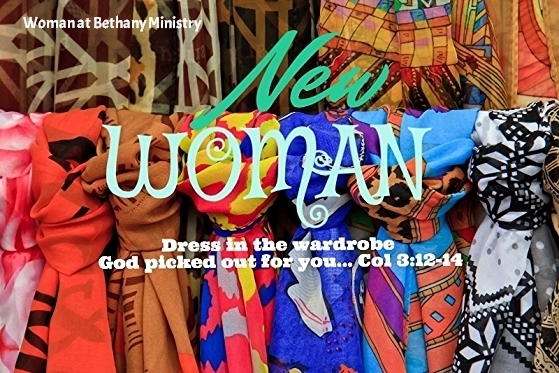 So, chosen by God for this new life of love, dress in the wardrobe God picked out for you: compassion, kindness, humility, quiet strength, discipline. Be even-tempered, content with second place, quick to forgive an offense. Forgive as quickly and completely as the Master forgave you. And regardless of what else you put on, wear love. It’s your basic, all-purpose garment. Never be without it. – Colossians 3:12-14 Prayer: My Father and my Lord, thank you for holding me in your tender love, thank you for your kisses and compassion that makes me complete and whole. Help me to preserve and care for my garment of splendour. By the power of the Holy Spirit, I refuse and denounce all worldly garments, instead I put on compassion, kindness, humility, quiet strength, discipline, forgiveness, contentment and gentleness. Halleluyah! Amen.